No matter the season, you will be treated to beautiful foliage, hollow trees to climb up on, a little stream, a beautiful lake (if you make the trip) and, of course, herds of deer. You will come across deer that look like bambi – light brown, white spots, fairly small. And you may think they’re the baby deer of the big, dark brown kind, majestic in their appearance and almost threatening in their proud and alert stance, with their imposing antlers. But then you’ll find they are in fact two distinct groups – the smaller Fallow deer and the larger Red deer. You may try to approach them to get a closer look and, if you’re feeling brave, to pet them. Royal Parks recommends a safe distance of 50 metres, but you probably won’t be able to get much closer anyway. The deer are good with people, but they haven’t lost their apprehensiveness. Richmond Park National Nature Reserve, originally a Royal hunting ground and one of London’s eight Royal Parks, covers a vast area of 2500 acres (that’s seven times the size of Hyde Park and three times that of Central Park in New York!). It is home to around 345 Red deer and 315 Fallow deer which have been roaming there freely since 1637. Red deer are indigenous to the UK, and they are the country’s largest land mammals. Fallow deer on the other hand were introduced to the UK by the Normans (from Normandy in the 10th and 11th centuries) and have since become the most widespread species of deer in Britain. 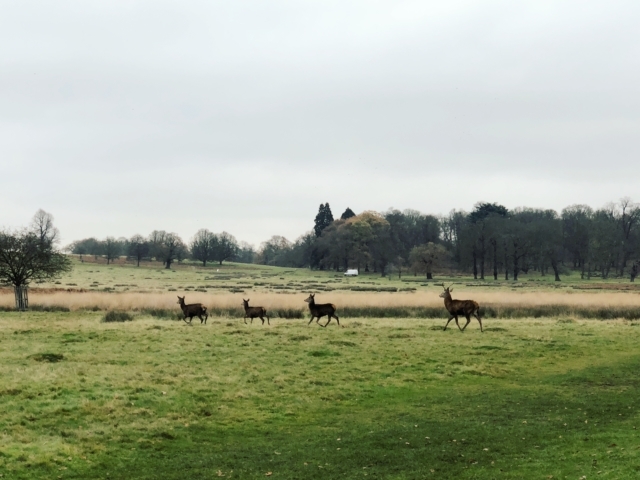 Richmond Park’s grassland habitat depends on the deer’s grazing as it prevents tree seedlings from growing, keeping the grassland open. As opposed to cutting, deer grazing also creates more variation in structure and plant diversity. Deer and park live in a symbiotic relationship which we can partake in and enjoy any day of the year. 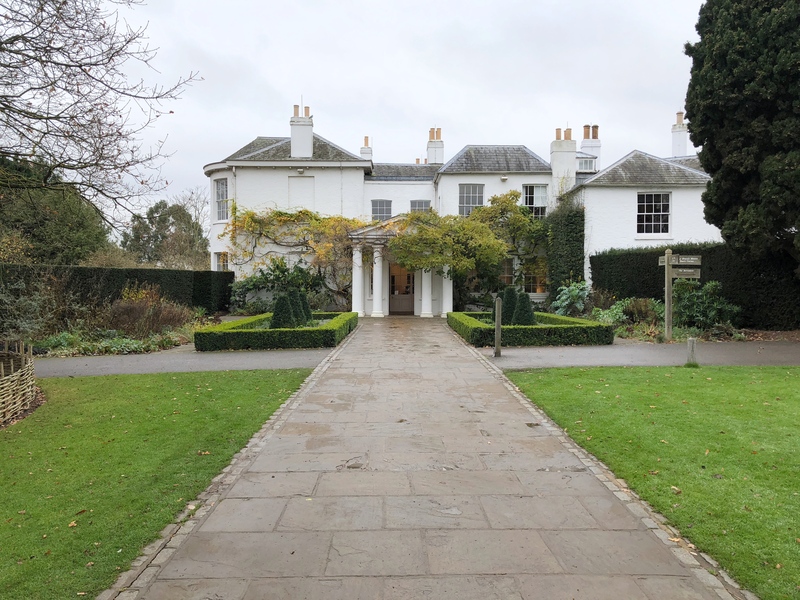 There are several entrance gates to the park, with Pembroke Lodge tea rooms located closest to Richmond Gate, not far from Richmond Hill, a scenic outlook of the idyllic river Thames and cow pastures. Pembroke Lodge, nestled on the top of a hill, offers a nice view itself. It’s most wonderful during the summer, when you can bathe in the sunshine on the terrace outside and enjoy a beautiful, peaceful panorama of the green park, houses in the blurry distance. Bertrand Russell, the philosopher and mathematician, event spent his early years here between 1876 and 1894, remarking later that he had grown “accustomed to wide horizons and an unimpeded view of the sunset” and that he had “never since been able to live happily without both” (Pembroke Lodge History). 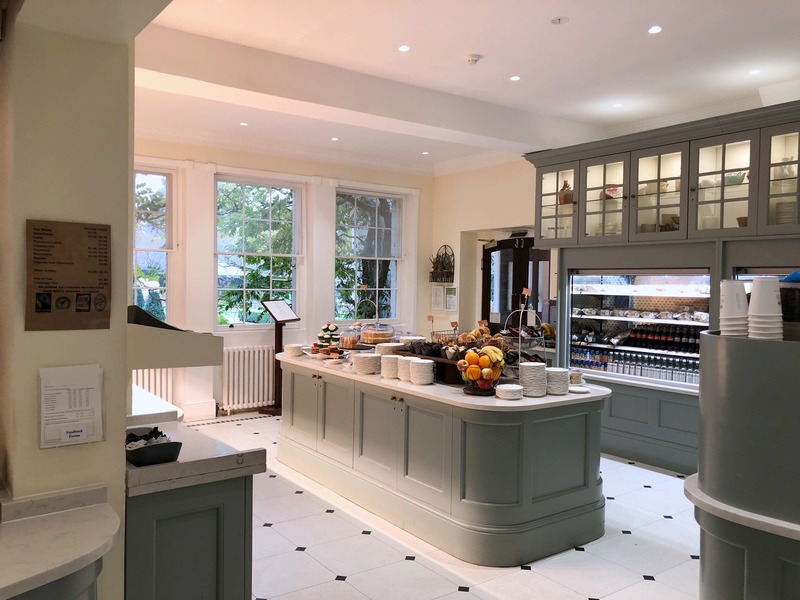 Pembroke Lodge is charming inside and out. It begun its life during the times of King George III (1760 – 1820) when the Lodge was a humble cottage of one room. This humility has extended into the present, despite high ceilings, large windows and decorative friezes. With its mahogany doors and floors, fireplaces, and a communal atmosphere, it almost felt as if we were in someone’s home. 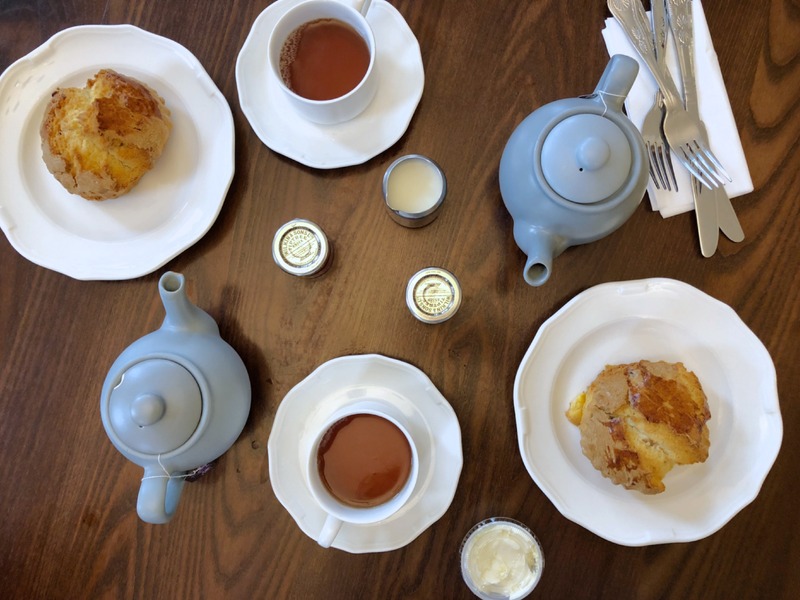 Comfortable and peaceful, my friend and I spread out our cream tea conquests on a wooden table. We had picked them up in the cafeteria in the adjoining room, the scones kept warm, the Earl Grey freshly brewed. The scones were big. They were crunchy on the surface and yet moist inside – a perfect balancing act. With the homemade clotted cream and Wilkin & Sons strawberry marmalade (they offered other flavours too), it was a true delight. And despite it being a grey day, simply the idea of a beautiful park just outside, waiting to be discovered, made us cheerful and at ease. What a break from the hustle and bustle of life.